Location: Immediately to S of Lloyds Bank. Dated 1901 on frieze. On site of former Siloam Chapel (1859) and retaining all but front wall of chapel, and re-using chapel roof raised to allow extra floor. Named after John Tudor Phoenix, member of building syndicate. Three storeys, three bays plus narrower bay to R. Red brick with bathstone dressings on grey rock-faced plinth. Entablature in bathstone with parapet, dentil cornice, and plain frieze with inscriptions 'Phoenix Buildings', and '1901'. Three bay main section of facade has, on first and second floors, end giant pilasters in red brick. Ionic pilasters in bathstone flank central bay. Engaged bathstone half pilasters in the inner angles of the brick pilasters. Bipartite windows with bathstone surrounds. On first floor shallow cornice over windows and string course at sill level. On ground floor, central doorway with segmental head is flanked by broad windows in same style; in bathstone with detailing in vestigial classicizing style. Narrow end bay (R) has brick pilaster to R on first and second floors and single light windows with bathstone surrounds. Wall surface is slightly forward of main bays. On ground floor, entrance doorway with shallow segmental arch and three keystones, with relief of pheonix above. 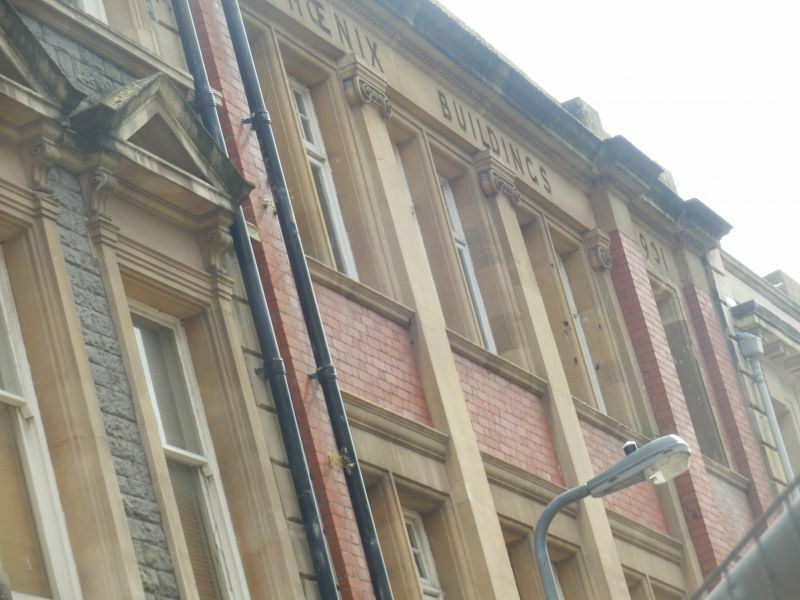 Listed for group value with neighbouring buildings in Mount Stuart Square Conservation Area. At the NE corner of the square opposite Barclays Bank and the former Coal Exchange building.